The Regional Steering Committee (RSC) has focused for over two decades on estimating the number of homeless people in each county and the region. We have often discussed the challenge of finding data to back the trends that providers see every day in shelters, housing and service centers. Early efforts centered on capturing a census of bed use and turn-aways. Statistical efforts using the AFDC-HAP program were done annually during the 1990's. With more wide-spread use of technology, and after substantial review of research methodologies, HUD began requiring that jurisdictions receiving federal funding for homeless assistance through the McKinney-Vento Homeless Assistance Act conduct a point-in-time (PIT) homeless count every two years. But how much do these PIT counts reflect what we see in our communities? And how do they fit with the other data we see, from HMIS, national studies, and other sources? The RSC has discussed completing the homeless census and evaluating the resulting data several times over the years. In June 2002, we discussed methodologies and the cost-effectiveness of counting the homeless. In May 2004, we looked into the value of HMIS in this effort. In November of the same year, HomeBase presented a briefing memo to the RSC on HUD's suggested methodologies for conducting homeless counts. In March 2005, April 2007, and March 2009, and January 2010 the RSC discussed the homeless count results for those years and provided feedback and impressions of the counts conducted in members' communities. In July 2007, we discussed methodologies for enumerating the homeless population. In 2012, HUD began requiring CoCs to conduct sheltered point-in-time counts in even-numbered years in addition to the existing biennial sheltered/unsheltered count; the RSC discussed approaches to sheltered point-in-time counts in that year. Most recently, in May of this year, we debriefed community processes for the 2013 point-in-time and housing inventory counts as well as plans for 2014. 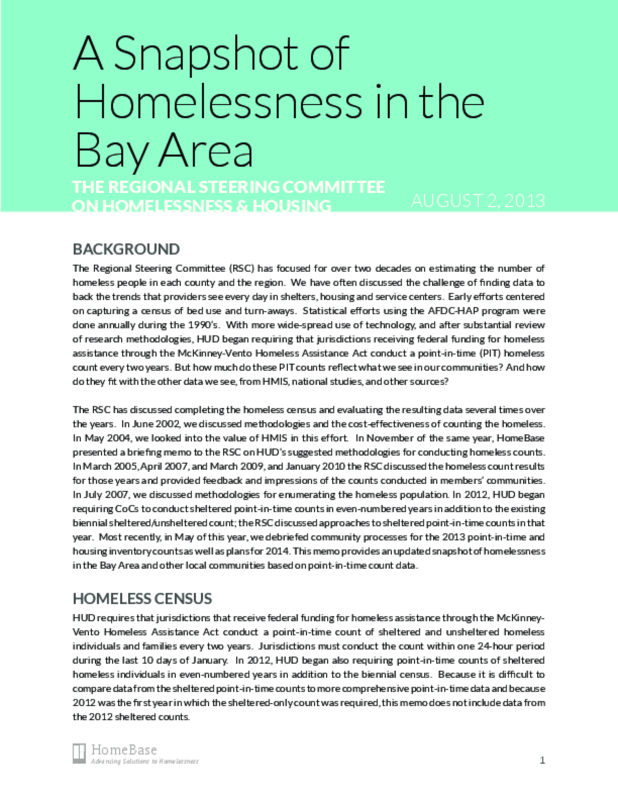 This memo provides an updated snapshot of homelessness in the Bay Area and other local communities based on point-in-time count data. Copyright 2013 by HomeBase . All rights reserved.